We can provide minimally invasive treatment for salivary stones which can be removed from inside the mouth without a scar to the neck. The first step would be to encourage salivary flow by doing regular warm salt mout baths. 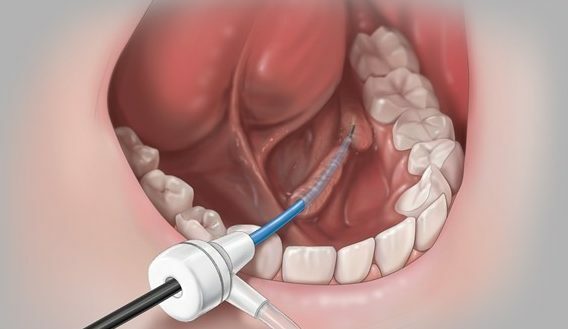 This can be effective in dislodging small stones in the salivary duct. Small to medium sized stones which will not move easily can occasionally be retrieved using a small camera and ‘basket’ whilst you are asleep. If this is not possible, surgery inside the mouth is often successfully. Where the stones are impacted inside the gland itself leading to chronics problems in a non-functioning gland, surgical removal via a small cut in the neck would be recommended. Salivary stones may be formed in the submandibular duct or more uncommonly in the parotid duct draining saliva from the parotid gland. The most common reason for removing a submandibular gland is as a result of infection that occurs if the tubes that drain saliva become blocked. Blockages usually arise as a result of stones. I will in the vast majority of cases remove the submandibular and parotid stones from inside the mouth without removing the major salivary gland. Parotid duct stone removal will often require a cut to be made on the skin as well as inside the mouth unlike submandibular duct stone removal which is done entirely inside the mouth. It is usually advisable to take a week off from work to recover from the surgery. During this time you should avoid strenuous activity. Is there anything that I need to do when I get home? It is important to keep the wound dry for the first week following surgery. This obviously means you need to take care when washing or shaving. Infection is uncommon but if your surgeon thinks it may happen to you a short course of antibiotics will be prescribed.